First I didn't know there's such a style of painting called alla prima; but I knew Aling Prima a matronly neighbour who beat her children senseless. She had 8 children, older ones my good friends. There was eldest son "Boy" who taught me basic guitar chords. He knew all Bee Gees and Beatles songs! (pre-Madonna days;-)He was self-taught and played oido (by ear) and smoked funny cigarettes. I often felt different as I passively enjoyed his company of music-minded people. I shunned others who played Russian poker in street corners, each one frozen like The Thinker of Rodin. Then there's Nene, a shy teenager who matured faster than normal. she had beautiful Malay sunburt face, eyebrows broken which drooped like wind-ravaged banana leaves. Nobody could catch her in patintero (tag game). Next was Indo, great childhood pal. Same birth month, same year but I was 5 days older. He shared with me his tex (game cards) and marbles and was a great warrior mate during neigbourhood slingshot wars. Next was "Baby". A bit tomboyish and never ran out of giggles. However all of them were brutally chastised when they displeased Aling Prima. I was mute eyewitness. Aling is respectful Filipino title for older and gentle ladies. Tell you what, Aling Prima was not gentle, I feared her and sometimes despised her. Then my life changed with arrival of new "kid" in town. Aling Prima bought a pet macaque monkey that came from Mindoro. Maybe I was about 7 or 8 and was very excited. Although chained Aling Prima's primate was able to glide horizontally on metal pipe ran thru ring at end of chain. It made a lot of noise as the monkey tried to shake chains off to no avail. When Aling Prima was not around it transformed into a lab monkey as we kids experimented on it with various stimuli (meaning we took turns feeding or tormenting poor animal). I raided Mother's kitchen and gave it vetsin (MSG), talangka (small mudcrab), fried fish heads, anything! However it got annoyed when I crossed the line beyond funny. One day I tested its patience with a tinting (palm leaf's midrib) and playfully tickled its nostrils and ears. I was surprised when it had a violent reaction. 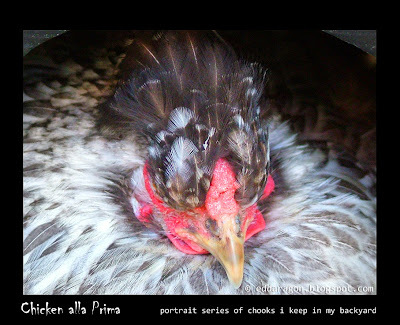 I learned it was clubbed earlier by Aling Prima to stop it from shaking its roost and shrieking continuously. After punishment it seemed traumatised and became scared of humans. Everytime I approached it'd flash an intimidating face, eyes bulging out, forehead pushed up 5-fold, lips retracted revealing red gums and mouth gaped steaming hot breath. 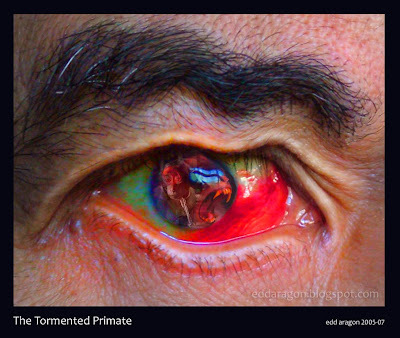 It growled in tremolo and made gutteral "ngoro-nngorooh!" sound (eeriely similar to name of a peak, the Ngorongoro Crater inTanzania); a final warning I confidently ignored. I thought I'd pet the little guy as if to say I'm sad and sorry for what have happened and not to worry. Then my luck ran out when I carelessly extended my hand too soon to touch its fur with my flimsy tinting. It caught my right hand in a flash and quickly sank its teeth in ball of my palm. It won't let go no matter how hard my puny left hand pounded its head. All the kids were screaming and ran for help. Finally a passer-by gave it a good conk at head with a piece of wood. Animal was knocked out cold but neighbours had to prise open its jaws to release my mutilated hand. Uh-oh, Mother was so upset and reproached Aling Prima for keeping a wild animal. They never talked to each other since. Oh great! I was talk of town; a troublemaker. Now I've ruined friendships. And I haven't even told you yet about me being a village sharpshooter with my slingshot (shanghai here in Oz). When I was angry I'd walk the streets and bust a few streetlights. One stone for each, fair dinkum! I fired from waist high but my eyes were fixed at the light globe. If there were street olympics I would have earned medals, instead I earned ire of neighbourhood. My dad was Barangay captain and I lost his trust as he apologised to community people. I tried winning my integrity back by doing big cartoon drawings of a fiesta celebration (a la Larry Alcala) which I posted on street walls. Children had fun looking at them as they tried to identify neighbouhood guys I cartooned. Not everyone was thoroughly convinced of my intent to rehabilitate. doctor removed bandage. I tried writing, it hurt but was all right. A few weeks later I could draw without much agony. Family said I was lucky as there was not much tendon damage and that animal's incissors did not cut across. I was elated showing my drawing to Mother. It was cartoon of a monkey. I missed the damn animal after it was removed from Aling Prima's premises. People were now able to walk through alley without fear of hair getting pulled by hairy hand. I dislike telling sad stories but somehow they become past reference points for creative activities like painting. Alla Prima was practised by Old Masters especially when making studies (mostly from nature) and working over an underpainting. Van Gogh (Bless his tormented soul) did painting in one session, mostly landscapes produced in St Remy and Arles. Now there's Fa Presto which is similar to alla prima as the paint is applied directly to the ground. The former however allows ground to show through and painting is planned. A few years passed; then one day Nene inadvertently left the electric iron hot and unattended while she was cooking rice at the same time, and to make things worse Aling Prima suspected Nene was seeing a boy in school (she was 15, 2 years older than me but we're team climbing up aratiles and caimito trees). That ignited fuse for this gelignite of a mother. Soon there were loud noises. See our house was just a good 4 meters away from theirs, much too within earshot. House trembled and walls made of thin wooden panels bulged and sprang back intermittently. Heartbreaking commotion shook house nails off! Mass of Nene's body rolled around floor and wooden walls for about 15 minutes. Damn I was sobbing silently while I heard Nene's tortured screams. Neighbours? No one was around! They disappeared. Her husband was a gentleman, but did nothing to stop sickening corporal punishment of Nene. Alla Prima (Italian for "at once") is direct painting, no need to build up colours with layers and finished in one session while paint is still very wet. It's fun and suits my hyperactive style of finishing editorial cartoons in a frenzied rush to beat the editorial timeline. No pencil drafts as the situation dictated. 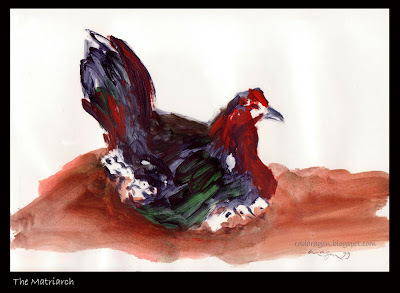 I drew what was in front of me pronto as my dry, worn-out brush pushed the pigments where I felt they should be. If you're trapped in an Italian airport you desperately get in touch with your Filipina friend and send a text message to her: "Venire alla prima!" Nene's sister Baby was hired by an Iranian family as domestic helper. Then I heard from his brother Indo that she got abused, lost her job and lost her mind and somehow ended up in Italy, and later on reported missing. I sorely miss her laughter. Aling Prima directly painted welts on dermal canvas. Blood clots that bore no aesthetic value at all (unlike tattoos) to poor child victim. Is it traditional for Filipinos to bash up their kids? Not really. Well my parents were no angels and also reprimanded me with a restrained whack at my bottom, my lola with a click of a narrow bamboo stick (ouch!) and a flick of a belt from my dad when I really did something wrong (like lighting up his shoes with lighter fluid after polishing it as I've seen older guys do it; however I lit it beside newspapers and lucky a couple of buckets doused the fire). No need to increase my threshold of pain. My corporal punishment only lasted a few seconds and pain was bearable. There ought to be a law determining difference between a mere smack and child abuse involving violent corporal punishment. Latter is barbaric and probably born out of ignorance-- and ignorance is universal. Here in Australia, "Spare the rod and spoil the child" was a hot slogan until corporal punishment was banned from schools except in Western Australia where it is limited, but legal in schools in Northern Territory and South Australia (do they have justifiable reasons? Beats me). She would open up to me sometimes about failing school grades due to, according to her, lack of books; but never did I hear a word of upset regarding her abusive mother. Years later she won jackpot in Philippine Charity Sweepstakes (much like today's Lotto). She left home, got married, had a family, invested poorly and was impoverished again. Last time I heard of her (early 70's) she was in a vague town in Cavite. I dedicate this blog entry to my female childhood friends whose innocent smiles were broken. I miss you guys. You were significant part of my childhood. And to Aling Prima who I learned had passed away, God Bless your soul. I wholeheartedly feel I've forgiven you for what you've done to my friends. It's sad you have confused me as a child. Painting helps me express stressful and negative experiences. 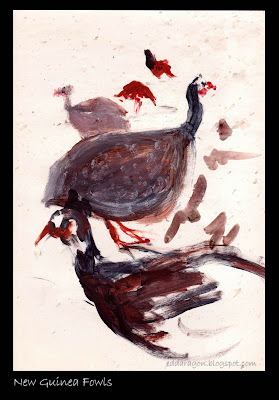 Let me share with you a few of my small alla prima acrylic paintings on vinyl sketch pads of chicken and New Guinea fowl which I did in 1999 in a huge property owned by a Filipino friend in Richmond (out here in Sydney's west). 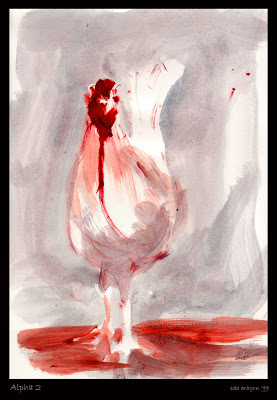 During my first visit I was surprised by huge number of chickens he raised. They were all over the place, even up branches of eucalyptus trees! A unique species that caught my eyes is the New Guinea fowl. These guys looked funny with rounded and spotted body and turkey-like neck, a peacock head and a flowery crown on its head. Unfortunately I didn't bring a camera with me but luckily I had a few tubes of acrylic paint and an old, half-inch flat sable. My sketch pad has enough thickness to hold up against vigorous alla prima brush strokes. The cheeky fowl never paused and ran away as soon as I approached. How am I gonna paint these guys? Din was deafening. 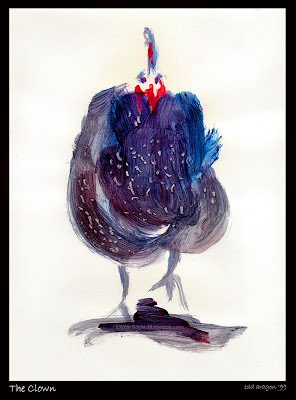 Le coq! An Alcatraz of a riot! 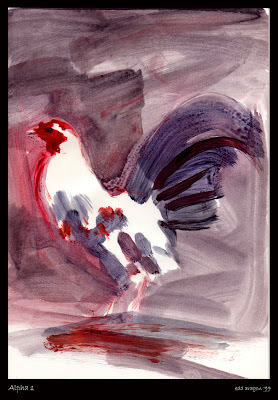 There were cackling hens, paranoid and screeching Alpha and Beta males, crazy and quick poulettes and orchestra of roosters crowing heraldic machismo to the heavens. Ah, chicken. I love and hate them. They can stink yet fertilise one's soul. They are part of mankind's tradition, from voodoo sacrifice to food-doo avarice...even Biblical as fowl crowed foul much to annoyance of St.Peter (Si-i-i-r, don't deny it!;-). I miss home. All Soul's Day and in Philippine countrysides, young people get musical for traditional "pangangaluluwa" (my nearest translation is serenading or soothing the Dead). Quite different from tweenies trick-or-treating during Halloween. It's more like a Christmas carol cruise where a group of adolescents goes house to house singing for alms while sneaky and sleazy breakaway team pinches a chicken or two while homeowners were distracted by "soul"music;-) and good chance a guy would try voyeurism under house of local beauty standing above bamboo-slatted floor. All in good, larrikin fun, they say. Bob told me to relax as he appeared from bushes with bucket of feed. 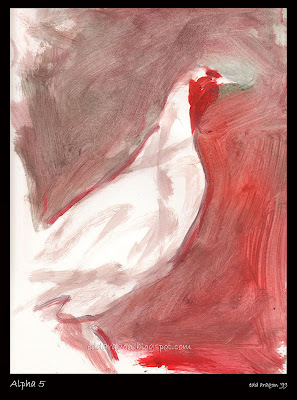 Like paper clips to a magnet, fowl converged around him as they hungrily gobbled an intriguing vitamin-rich feed that Bob himself concocted. 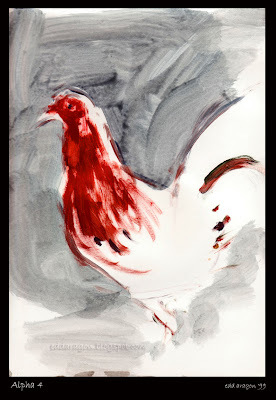 I took advantage of the commotion and quickly drew any bird that came nearby (scanned images of paintings dispersed in this blog entry). I've unscrewed all 4 paint tubes I've got and painted alla prima style. 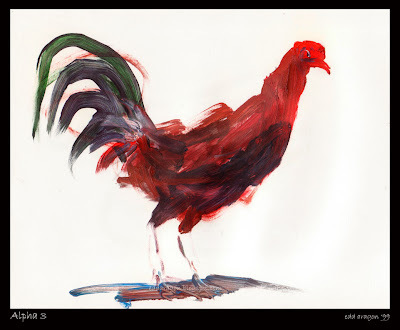 I had to, these guys made my mind and eyes shifted so fast I often lost track of particular chook I was painting. 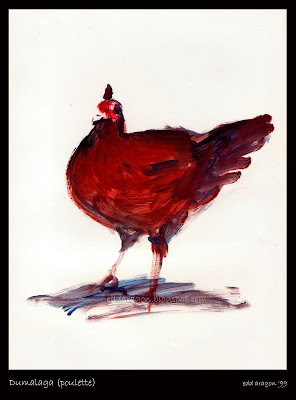 As I struggled with "Texas" male I realised that an erring stroke or misplaced chicken leg could ruin the painting. It took me an average of 5 minutes to finish each painting. Fair dinkum! 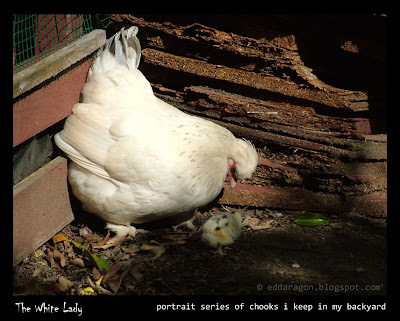 In one of Bob's cages paneled by old real estate promotional signs was a nervous hen with a lot of chicks underneath her protective feathery skirt. What an awesome sight. Sheer and pure maternal instinct displayed (here love seemed automatic! Isn't that the way it should be?) Like breastfeeding mothers, they just stick it in a hungry baby's mouth without her even consciously thinking about it. of his property. 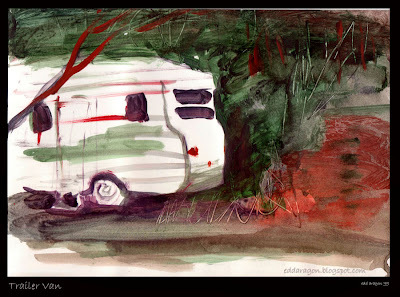 "Hey Edd, you could use this trailer van as studio camp anytime you wish. 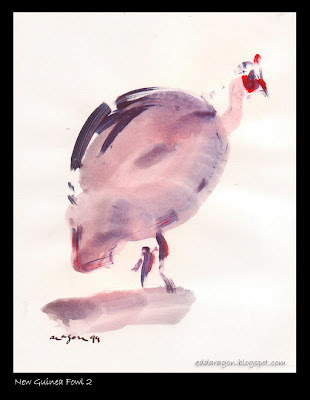 You should see the low flying cranes in the morning." Definitely an offer I couldn't refuse. "Soon Bob, soon." I thanked Bob for wonderful time and left him couple of paintings to his delight. 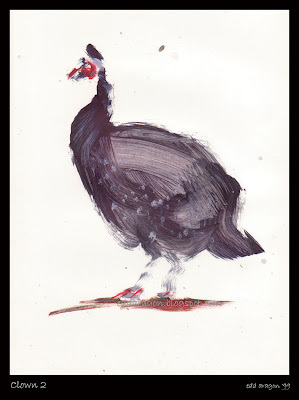 On way out I picked up a nice New Guinea fowl feather (scanned image above ). 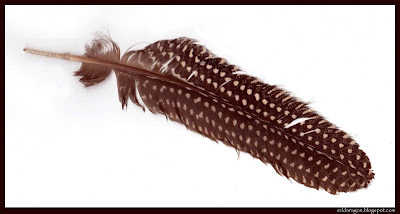 The dotted feather looked magical! For you Nene and Baby, my beautiful childhood friends.. wherever you are now, I pray to connect the dots.